CUSCO, in the Peruvian Andes, was once the capital of the legendary Inca Empire. It is also the place where I discovered that the airline had lost my luggage. Travelling light is great in theory, but early the next day I was due to board a train to visit Machu Picchu in the rainy season. I had a feeling that my walking shoes and jacket (which were among the belongings left behind in the chaos that was Lima airport) would be quite handy. I wasn't the only one to arrive with no bag. It appeared to be a fairly regular occurrence judging by the way the luggage-less began to queue up at the baggage counter almost before the conveyor belt was turned off. The woman on duty told me helpfully that my bag had probably been left on the plane which had already taken off "into the jungle, to Puerto Maldonado". I'd been wanting to visit the Amazonian Basin for several years so it was rather galling to discovered that my luggage was possibly going to get there before I did. However miraculously, only about five hours after I'd arrived in Cusco, my bag appeared in my room. It had apparently not been to the jungle at all but had never left Lima. Unfortunately the process of retrieving it had taken up most of the afternoon, so the little I saw of Cusco was mostly on a dark and rainy night. What I did, frustratingly briefly was a city centre that deserved several days of exploration. Plaza de Armas is the heart of the city, with its two stunning 17th century Spanish colonial style masterpieces, the cathedral and the Templo de la Compania de Jesus dominating two sides of the square. Both had been built on the foundations of Inca palaces but regrettably I would have no time to visit either of them. However, this will provide the perfect excuse to go back sometime. My clearly being in a rush to see what I could even in the most cursory of ways didn't deter the hawkers at all. Cusco is an important economic hub for the local indigenous people, the Quechua (who speak the same language as the Incas did. The production of traditional handcrafts (especially woollen goods and woven textiles) is big business here. Within a few steps of my hotel I was besieged by women with armfuls of alpaca socks, hats and mittens. They trailed me down the street where I was then caught in a pincer movement by two more women waving painted and carved gourds at me. All the saleswomen were dressed in traditional Quechua garb of capacious gathered skirts with brightly coloured shawls around their shoulders and everything topped off with a bowler hat. Most of the latter were black but one of the most insistent sellers was sporting a hat in red velvet; a sign possibly of her superior sales techniques paying off. Four pairs of socks, two hats and two gourds later I escaped. I hadn't wanted any but blamed my weakness on the altitude - I'd flown direct from sea level in Lima to Cusco's rarefied air at 3400 metres. 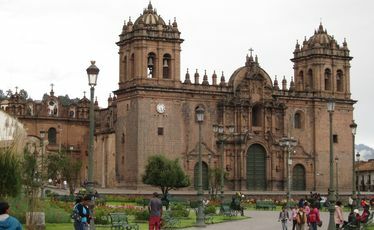 My hotel, the centrepiece of which was a cobblestoned central courtyard (adorned the next day with a local weaver's textile display and further enlivened by the presence of her pet lamb), provided limitless free cups of coca tea, known locally as mate, to help alleviate altitude sickness. It's also supposed to be a mild stimulant and to suppress hunger and tiredness. It may have done all the above but from a taste point of view I'd prefer a pisco sour any day. (For the uninitiated pisco sour is a cocktail, first invented in Peru which contains Peruvian grape brandy, egg whites, lime juice and bitters). I sank a nightcap of coca tea while squirrelling away what looked like half an alpaca's worth of woollen goods into my newly arrived suitcase. The tea is not easy to drink delicately as it's made by at least half filling a cup with the dried coca leaves (similar in appearance to bay leaves) and then pouring over hot water. It's then a matter of sieving the liquid through one's teeth if you don't want to munch through mouthfuls of soggy vegetative matter. My alarm buzzed only a few hours later as I was due to leave at 5am for Machu Picchu - the lost city of the Incas. It was never found by the Spanish Conquistadors of the 16th century, partly because it was so remote and inaccessible. Today it's firmly on the tourist map (especially since it was voted one of the new seven wonders of the world) and is a little easier to reach. However the journey still involves two bus journeys, a train trip and as much walking and climbing steps at altitude as you can handle. Maybe the coca tea really would come into its own.